Join Marygrove for dinner on Tuesday, April 9th at the Panera Bread in Kirkwood! 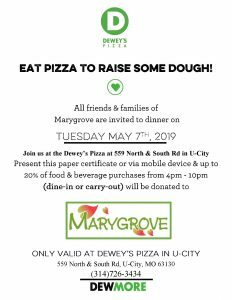 Bring this flyer with you or show an electronic version to the cashier between 4:00pm-8:00pm on this day, and 30% of sales will be donated to Marygrove!! Proceeds will support youth impacted by abuse, neglect or other trauma, move towards a stable and healthy future through quality residential and therapeutic treatment and support. Enjoy delicious food and mingle with friends all while supporting a great cause!